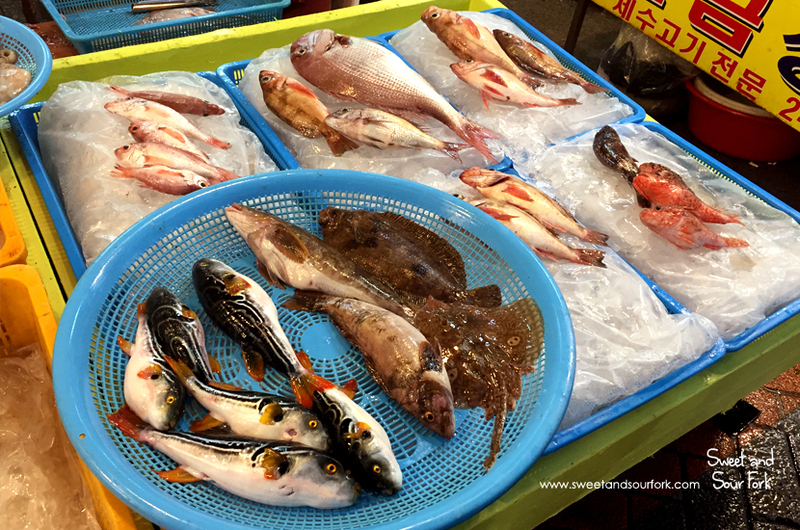 Some of you may know that I have just spent a couple of weeks in Korea and Hong Kong, and whilst I had promised myself I wouldn’t blog, I couldn’t resist taking at least some happy snaps of the glut of food that I ate, so here they are! 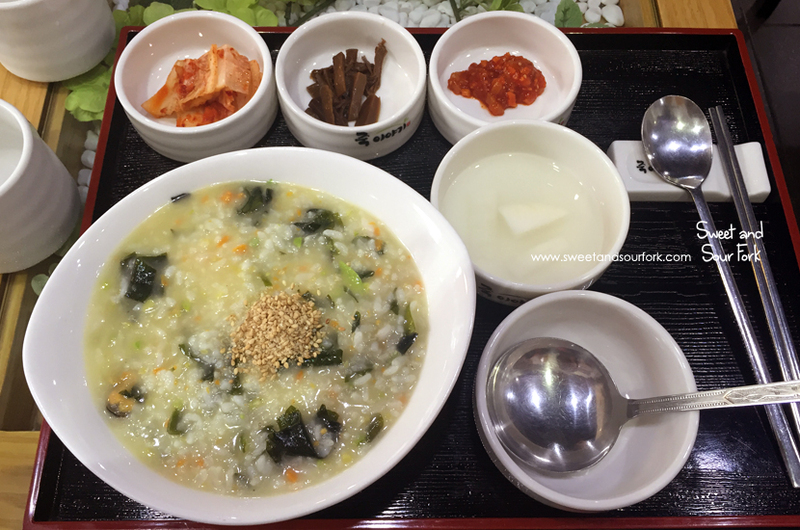 This is the first thing we ate in Korea – Chicken Ginseng Juk (Korean rice porridge) and Pork Bone Soup. 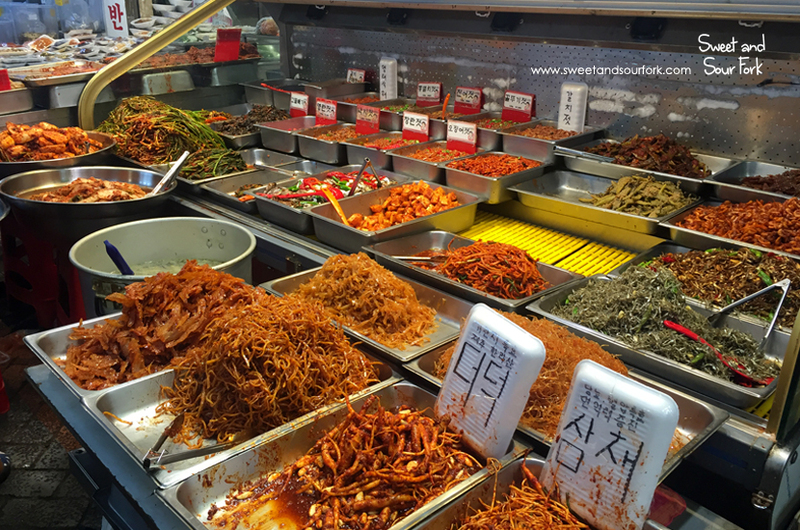 Check out all this banchan! And it’s bottomless self-serve too! 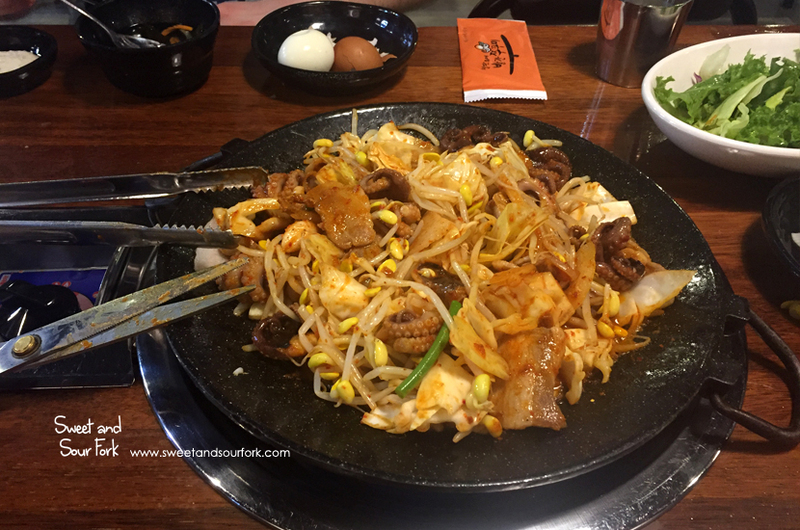 On our first night we had Pork and Octopus Dakgalbi. 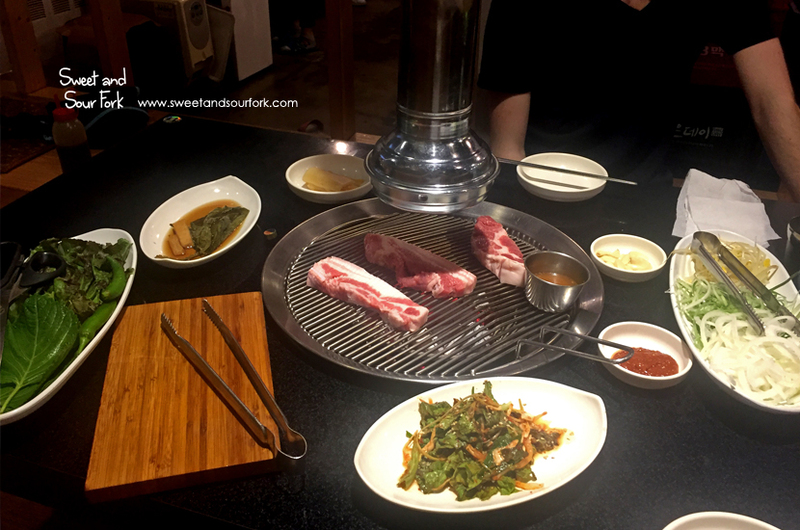 Basically think a plate of meat and veggies cooked in gochujang at the table, served with perilla leaves to wrap it in and more banchan (of course). More juk! 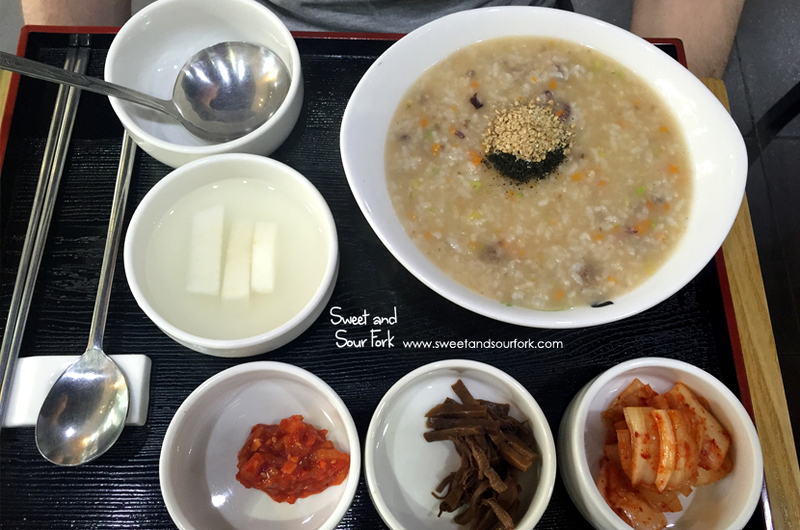 We had a place just down the road from our hotel that does nothing but juk, and for breakfast we had the Seaweed and Mussel Juk, and the Octopus and Beef Bulgogi Juk. Look what I found!!! 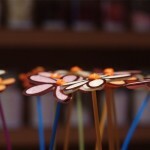 The Waterdrop Cake that blew up social media a few months back! 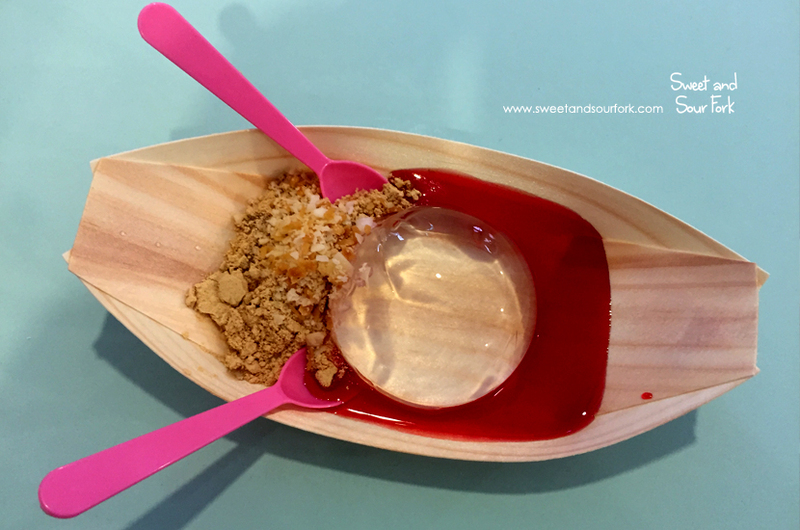 To be honest it was like eating a lightly sweetened jelly, but it was quite nice with the peanut powder and strawberry sauce. 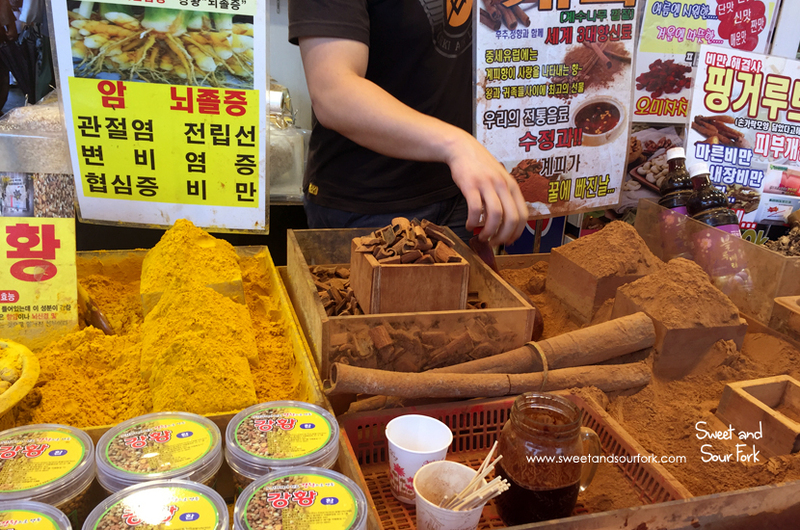 There were of course markets galore, selling everything from clothing to cooking utensils to tacky souvenirs galore. 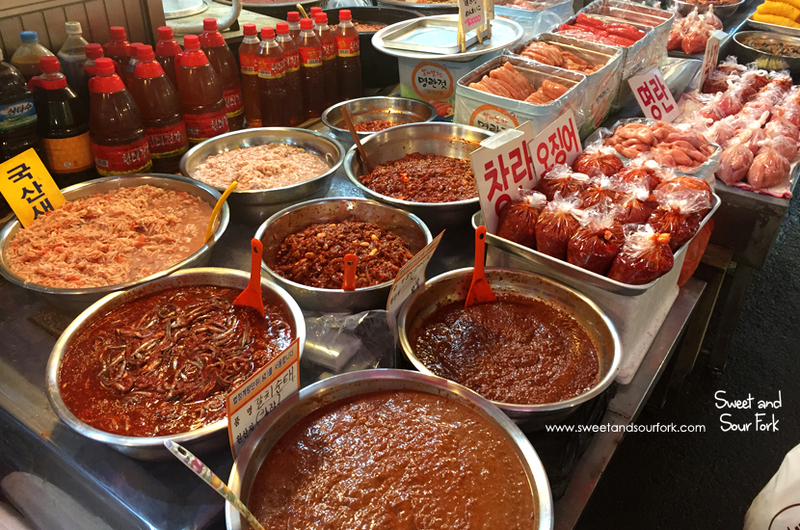 I was of course most keen on the food; there was a boggling array of kimchi, dried goods, and even stores dedicated to gochujang. And fish cake. 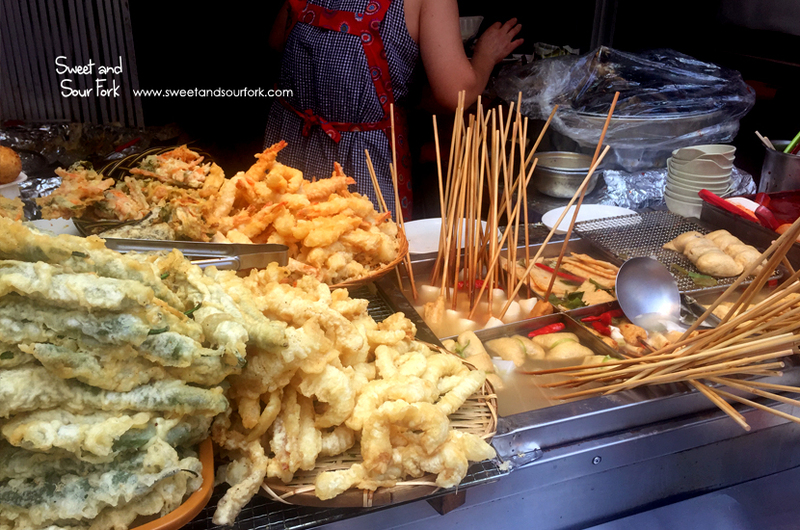 My god there were so many dedicated fish cake stalls; it’s an absolute wonder that they haven’t all pushed each other out of business. 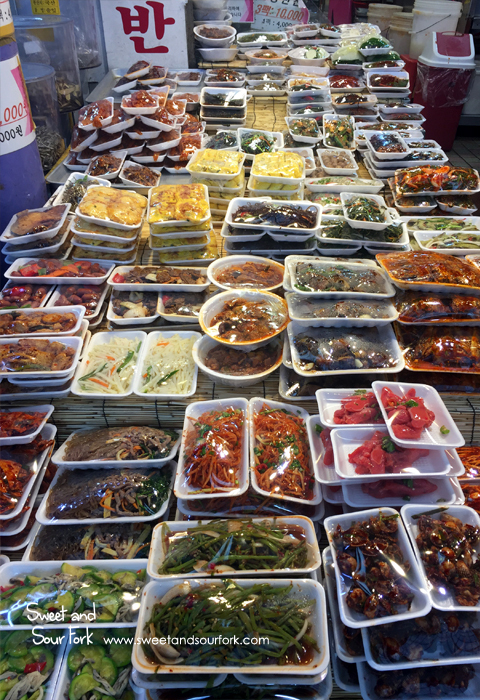 But the best bit of all about the markets was the street food. 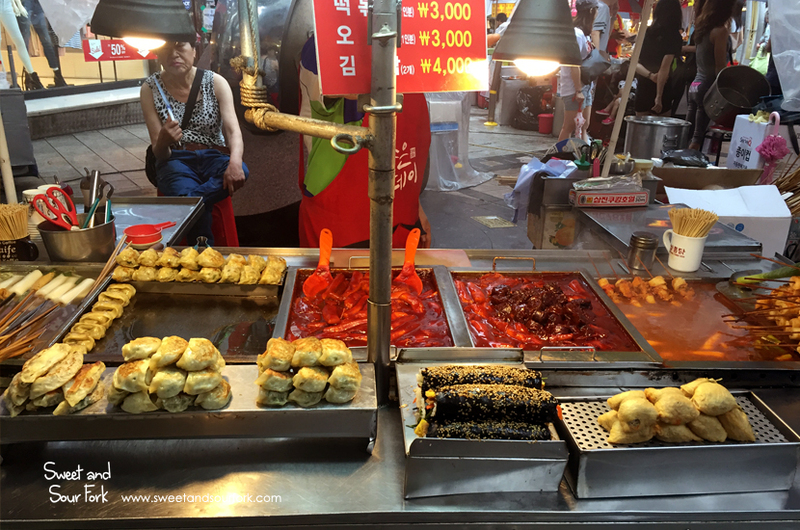 I ate everything from dumplings to fried chicken to fish cakes off a stick, but my favourite was tteokbokki, cooked over large vats in fiery red sauce, to be eaten with a toothpick on the narrow ledge at the vendor. 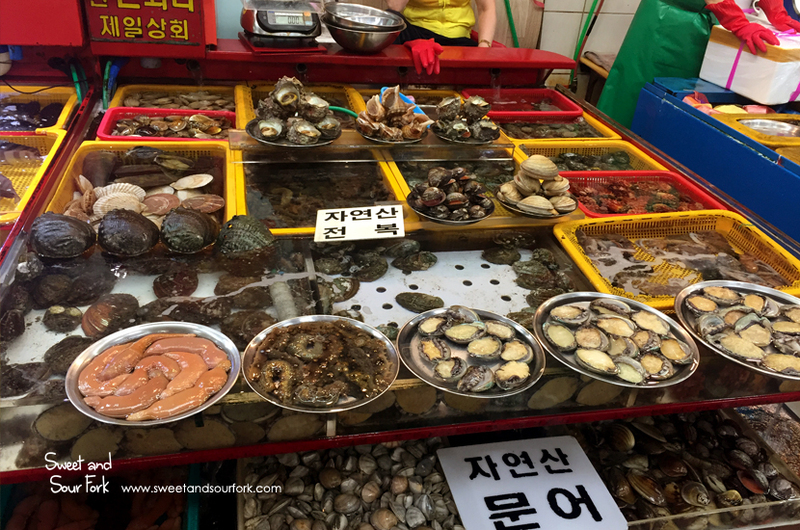 Busan being a port city does a roaring trade in seafood. 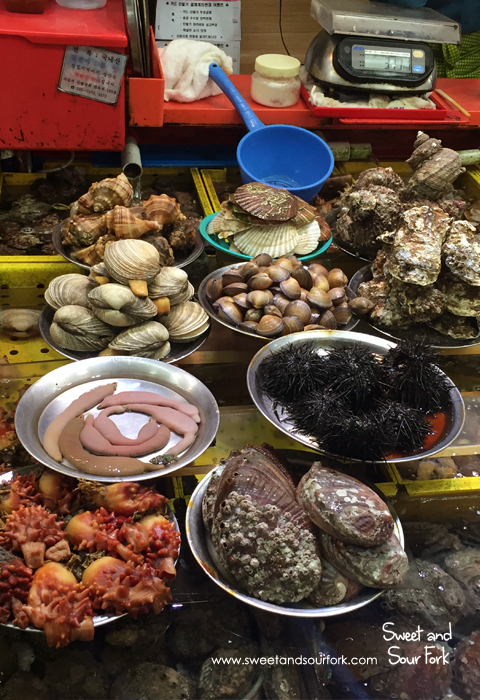 Jalgachi is a veritable seafood cornucopia, with an enormous ground floor dedicated solely to hundreds of kinds of marine life, most of which I had never seen. 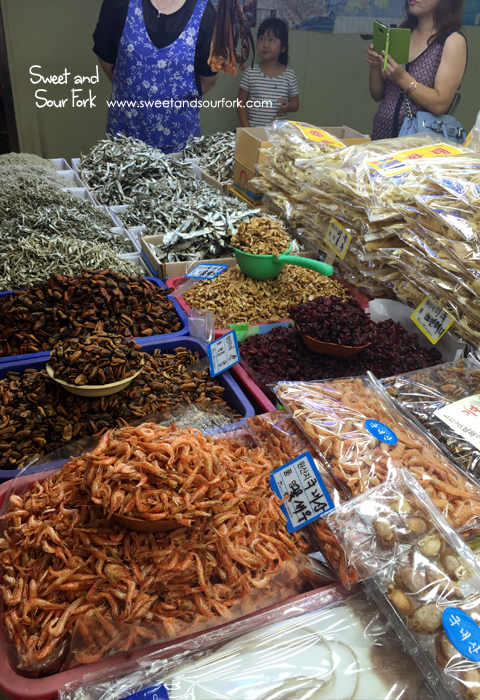 There’s also a section for dried seafood goods. 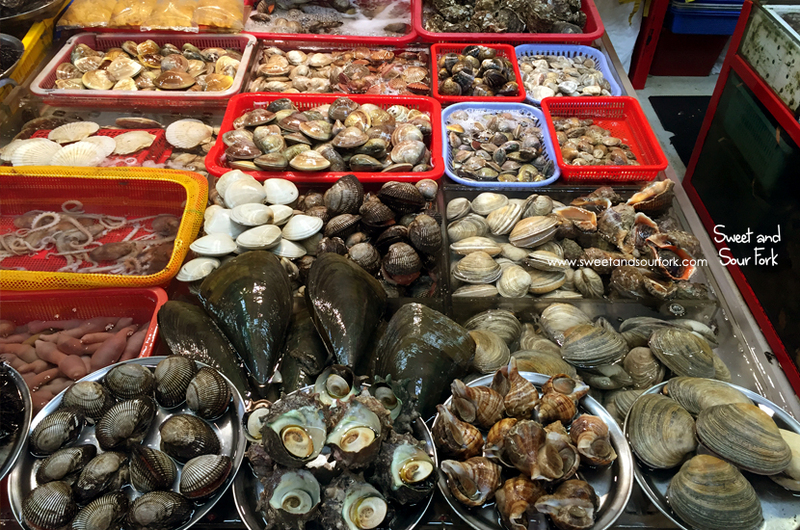 You can take your purchases from the fish market upstairs to have the kitchens cook it up for you, but we decided to order straight from the restaurants instead, as they still caught and cooked everything fresh. 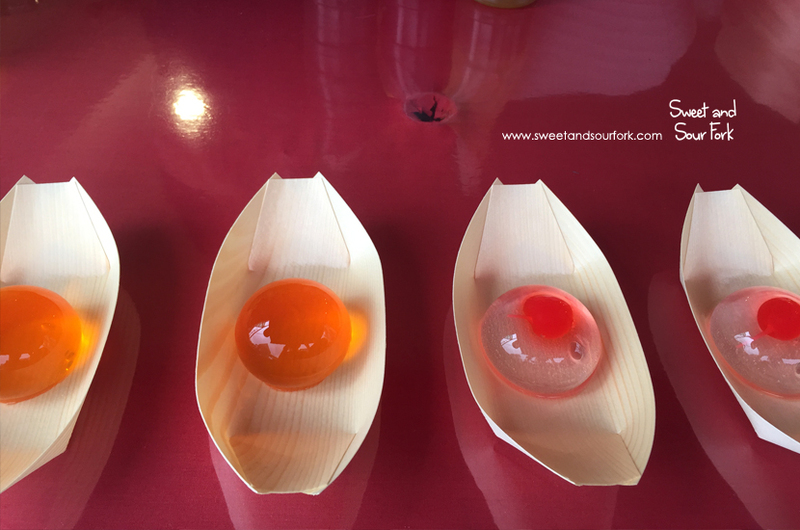 Our order of Flatfish Sashimi came with an absurd range of accompaniments, and we were also given some complimentary dishes by our waitress – a small Chive Pancake and a Grilled Fish. 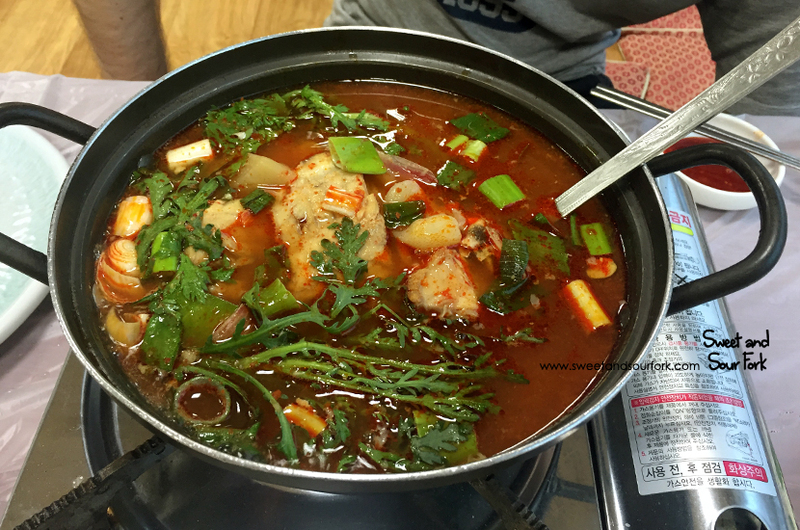 Once we were done with the sashimi, our fish was then cooked up for us in a spicy soup, and served with rice. 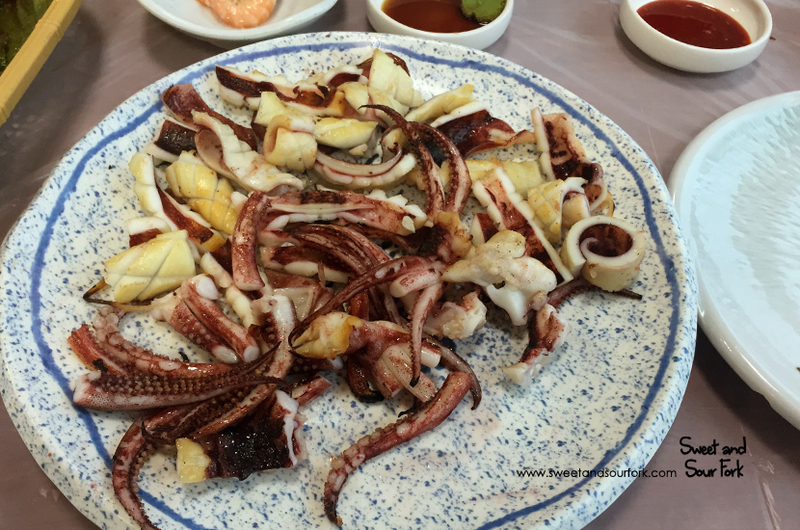 We also ordered some fresh BBQ Squid, which was magnificent eaten hot off the grill with a selection of pickles. We spent our entire day at Shinsengae Centum City, aka The Largest Department Store In The World – Guinness Certified! There was so much to eat there that there was a separate directory just for the food, and we ended up just eating there the entire day. 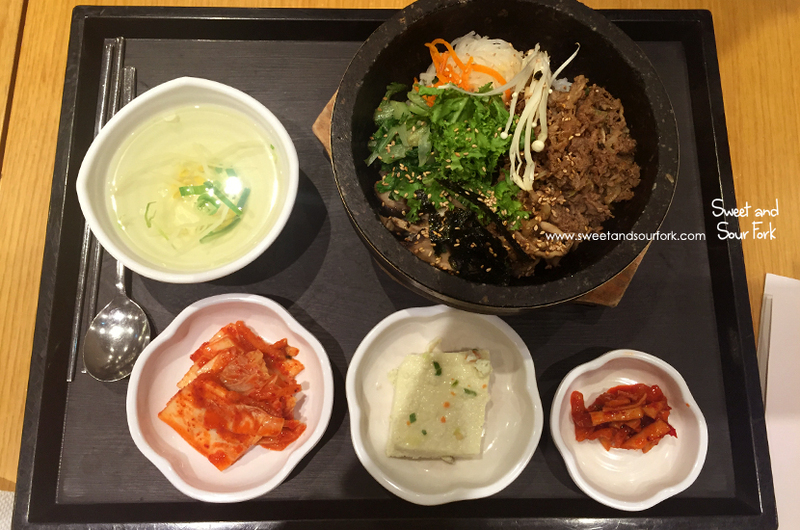 For breakfast we started with a Beef Bulgogi Bibimbap, which came with sprout soup on the side. 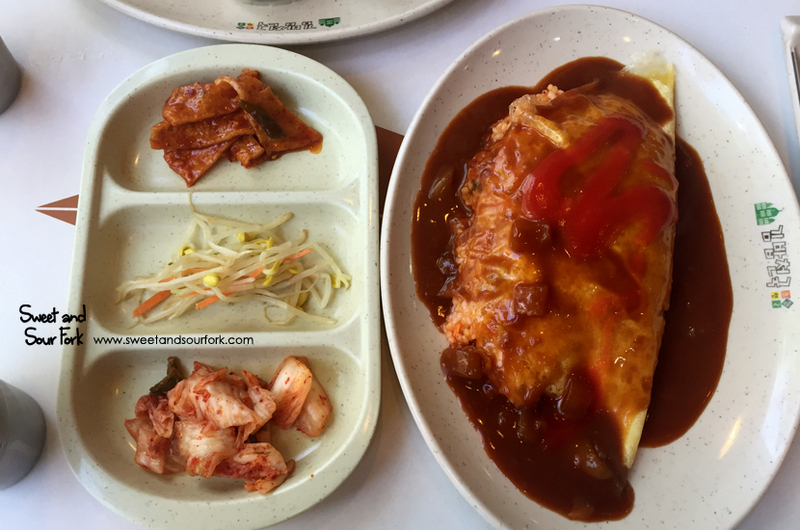 To be honest I didn’t actually think this was amazing – it needed an egg on top and some gochujang to mix through if you ask me! 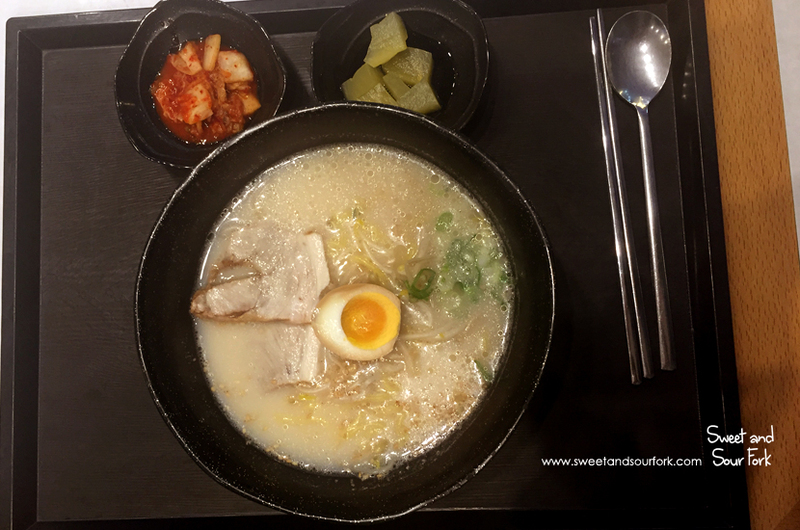 We also had a bowl of Pork Soup. Just like the first one we had, this was unsalted to the point of blandness. 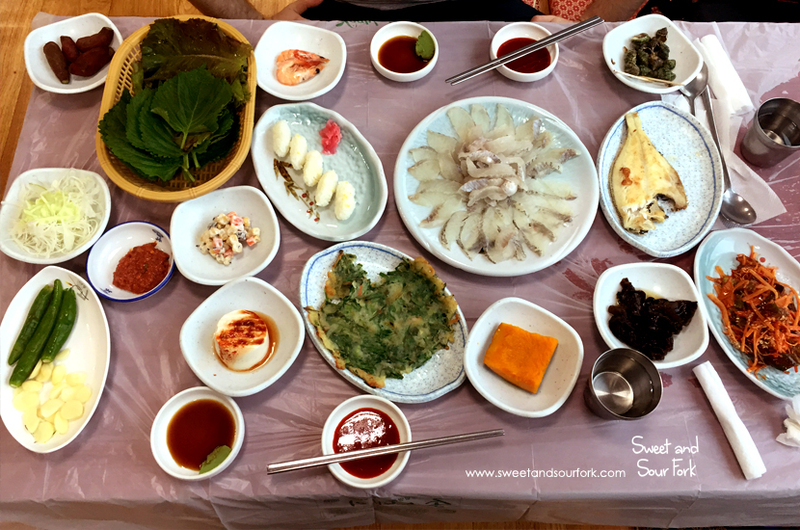 I came across my answer when I tasted the little plate of shrimp, thinking they were banchan, only to screw up my face at the saltiness. Once I tipped them into the soup however, the whole experience fell into place. 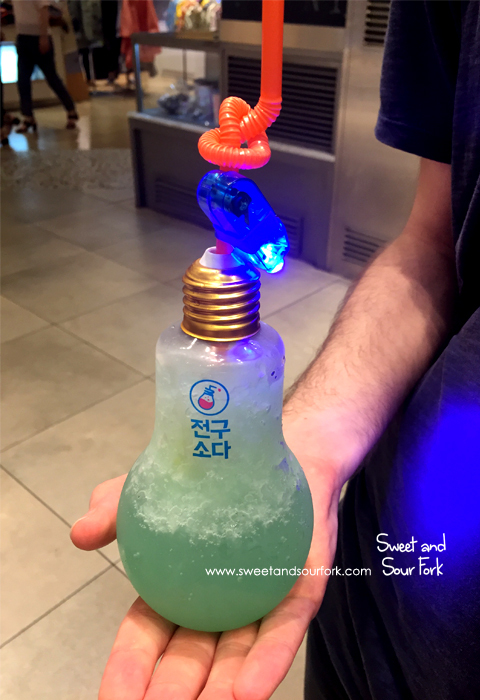 Chris insisted on having this Blue Lemonade Lightbulb Drink, which was about as gimmicky as it comes. 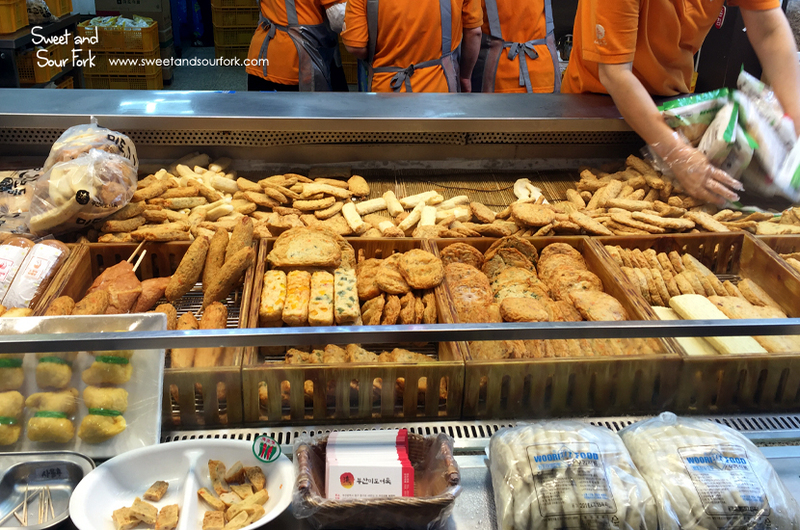 We also noticed a massive line of people waiting to get Cheese Tarts from the franchise Bake Cheese Tart, and we were curious enough to join them. 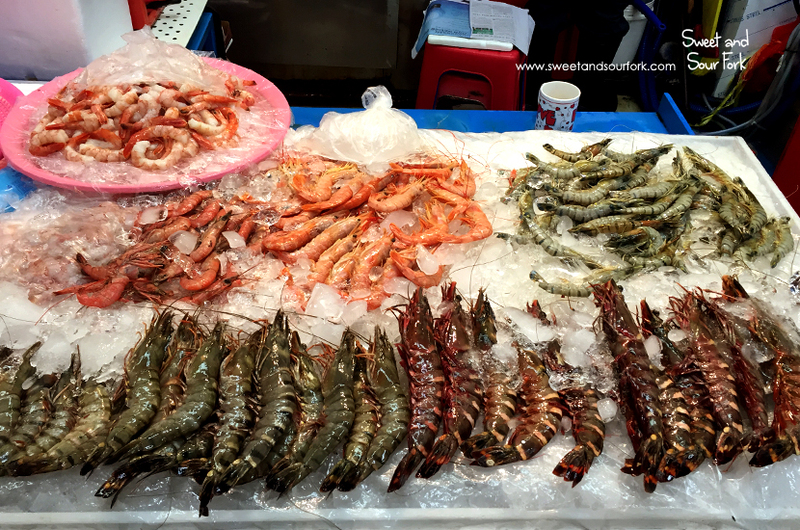 The signs said these cost 2800 KRW (approximately $3.5 AUD), and there was a limit of 7 per person. But seriously, what is the fuss? How good can tarts be? Well. As it turned out, these were amazing. Like eyes-rolling-into-the-back-of-the-head-and-making-inhumane-noises amazing. 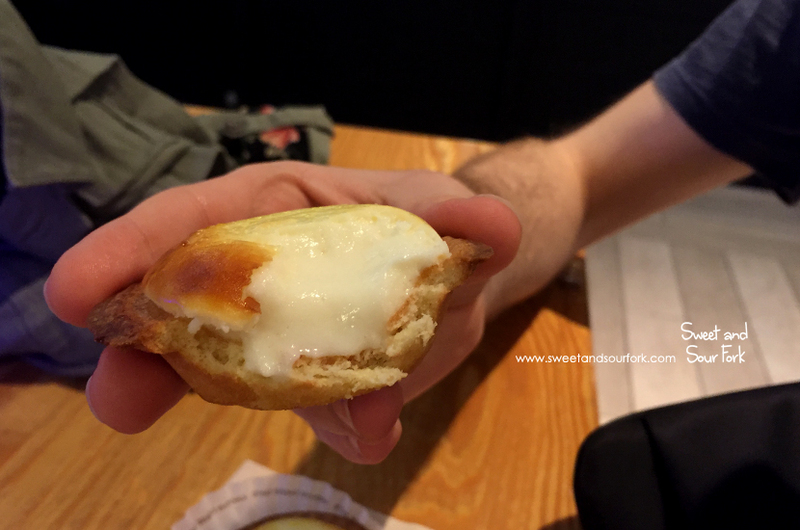 The buttery pastry was filled with the silkiest, creamiest mixture that tasted like liquid cheesecake. 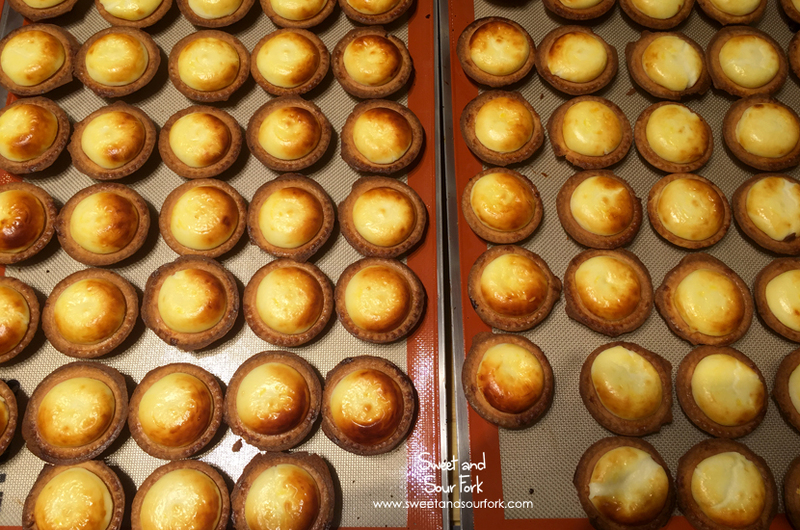 Thank goodness there’s a branch of Bake Cheese Tart in Hong Kong not too far from our hotel. We had dinner in another one of the 4 food courts – this one had an ice rink in the middle! 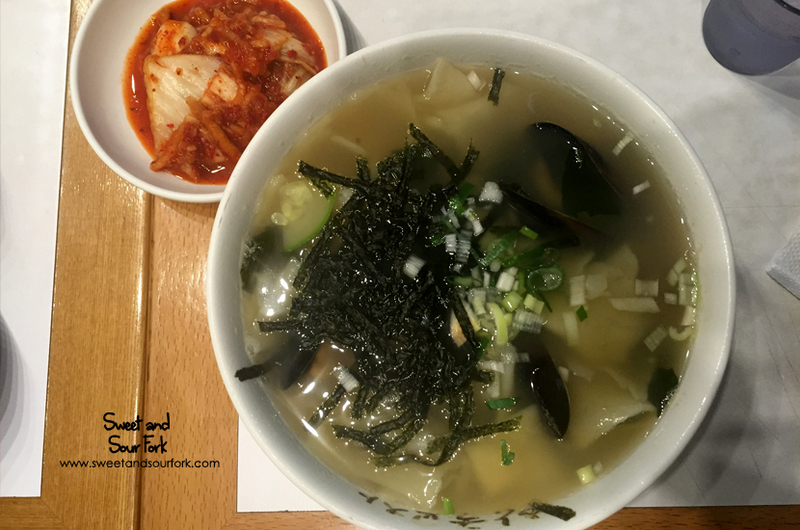 The Seafood Noodles lived up to their name, with a lovely briny broth and heaps of shellfish. I was also curious enough to order a bowl of Tonkotsu Ramen, which is nowhere near as good as what you get in Melbourne these days. But then again, had this been 2013, I would’ve raved at just how delicious this was. There’s a 24-hour greasy-spoon-esque restaurant just across from the road from our hotel, and we decided to check it out for breakfast after the place we wanted to go to was closed. 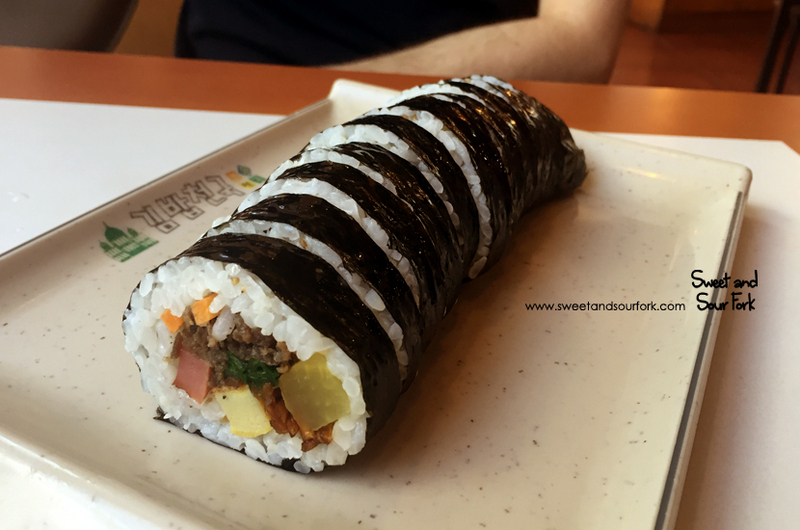 I finally got to try the Bulgogi Kimbap – a bastardised version of the sushi roll filled with things like ham and egg and pickles that was nevertheless surprisingly delicious. 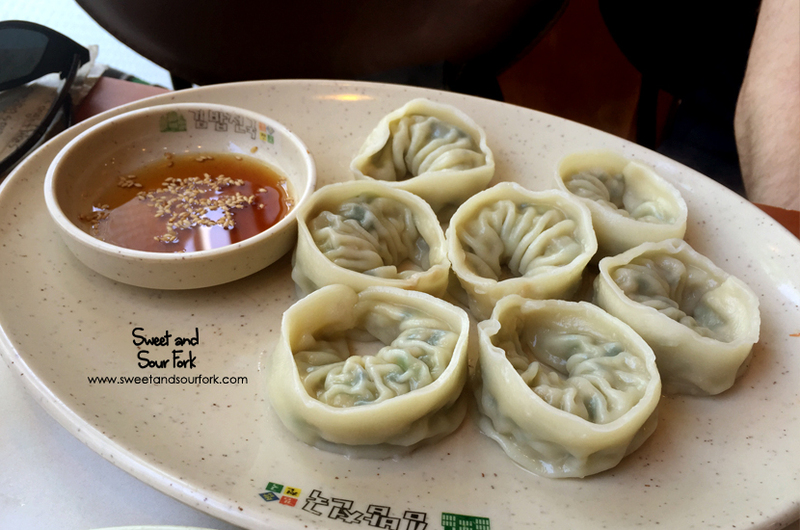 We also had some Meat Mandu (dumplings), which were stuffed with a mixture of pork and chives, and actually really, really good. Neither of us were very keen on the Omelette Rice, which tasted oddly sweet and came in a puddle of cold BBQ and tomato sauce. 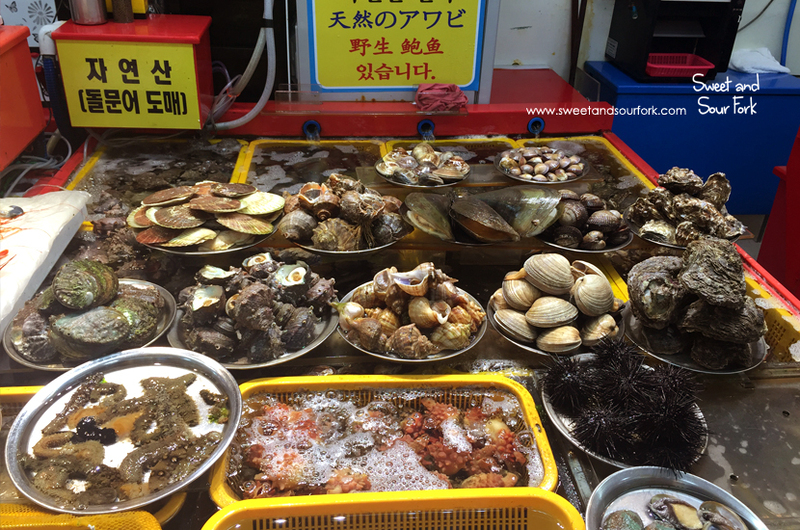 But what we were most impressed with was the price – we got all of this for just 12000 KRW, aka about $13 AUD! 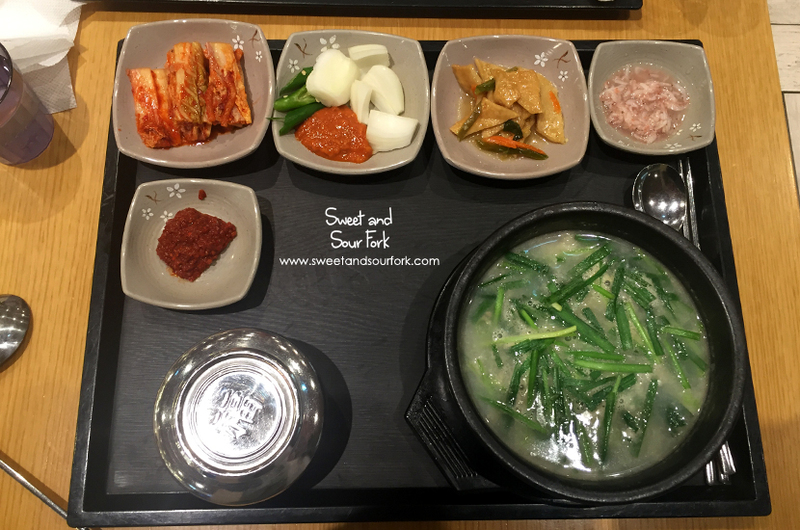 We snacked our way through the day, before finishing up with our very first Korean BBQ! Unfortunately the restaurant had neither menu nor staff in either English OR Chinese, I ended up asking our waiter to order for us. What we ended up having was two slabs of the fattiest most delicious pork belly ever, fat-marbled beef, and a pot of delicious Cheonggukjang Jiigae. 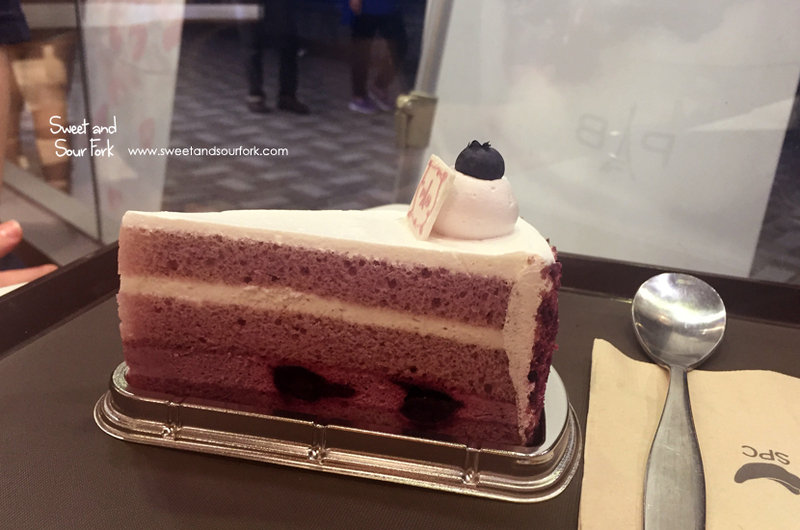 Then we snuck off for dessert at a chain called A Twosome Place, and we had this delicious slice of Blueberry Yoghurt Cake. 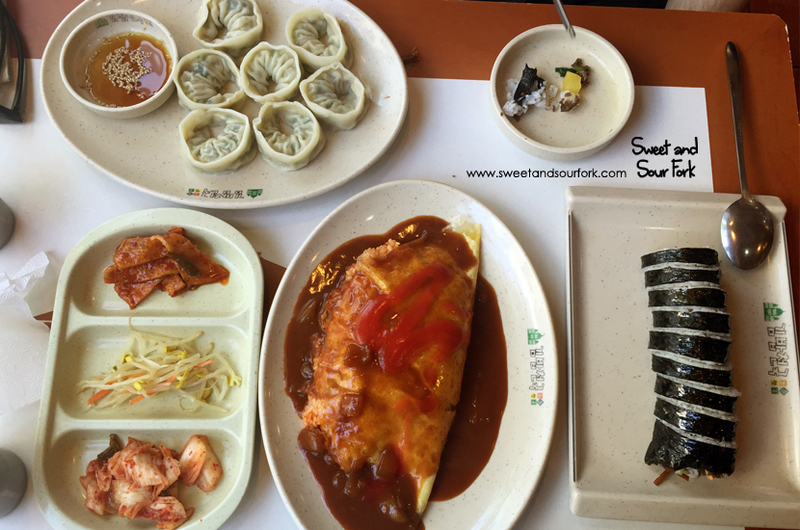 This was our last morning in Busan. 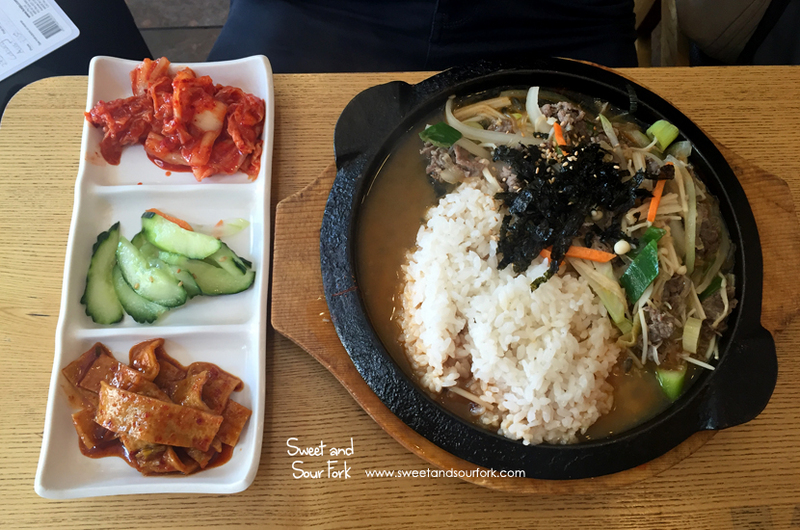 We started the day with a plate of Beef Bulgogi On Rice on a sizzling plate, which actually didn’t sizzle. 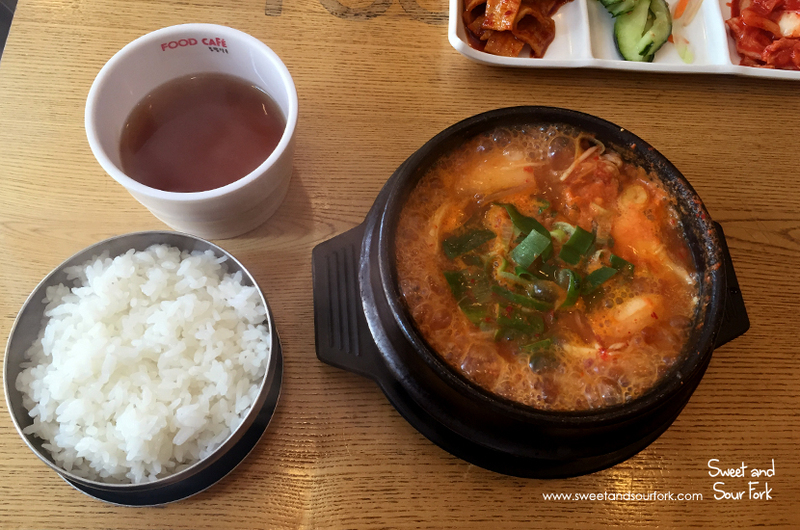 As well as a pot of delicious Kimchi Stew. NOW ONWARD TO SEOUL! 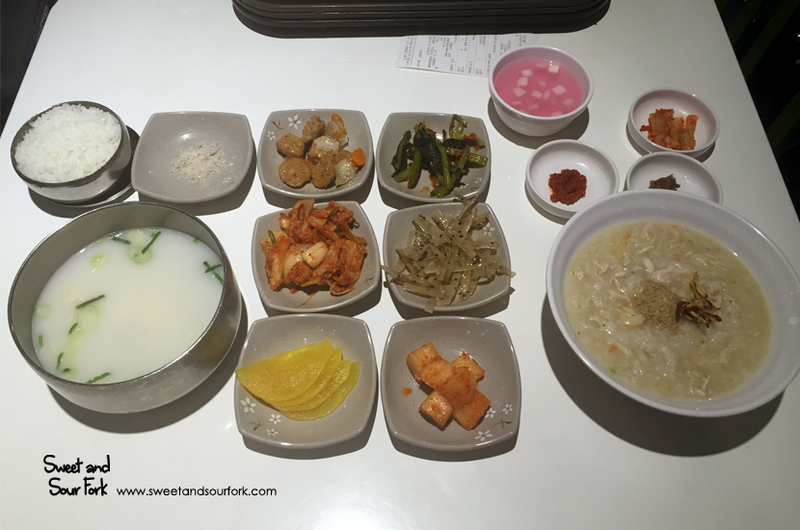 very jealous of the banchan options. looks awesome! Hi Nean, thanks for dropping by! 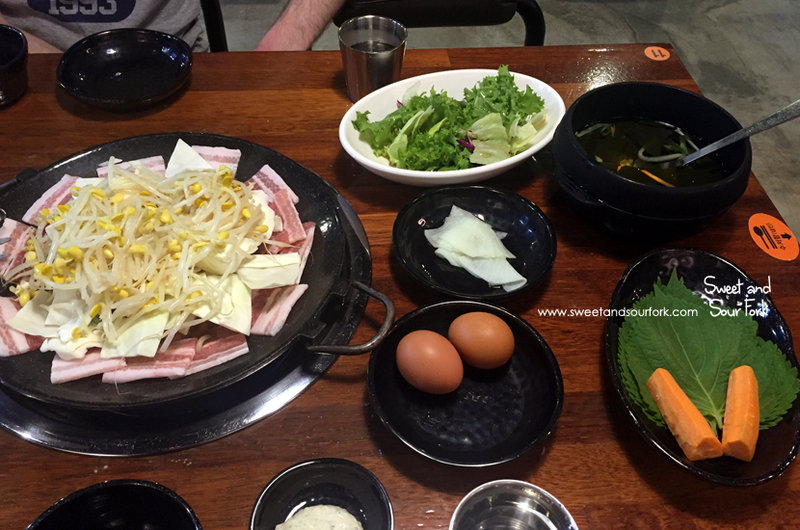 I have to say that as much as I love Melbourne, the banchan options here now leave me rather disappointed after my Korea trip! At what place you got the lemonade? Where is it? Thanks!